Beautiful 3 Bedroom / 2 Bathroom house with handmade furniture and Wi-Fi. The house is located within a small Borgo (hamlet) close to the majestic hilltop town of Todi in the heart of Umbria. It has been finished to the highest of standards with original materials, handmade and painted Italian furniture and all new appliances including wi-fi internet access. It has its own private gardens (0.25 acres) and the use of a beautiful, large swimming pool (approx 15 x 8m / 46 x 25 ft) and AstroTurf tennis court set within 11 acres of grounds. Set in the most peaceful of locations with sweeping, uninterrupted views over the surrounding countryside, the house is just 50 minutes drive from Perugia airport. The House: The house forms part of a small Borgo which has been restored in its entirety to a very high standard using original materials. With commanding views over the surrounding countryside, it has private gardens (approx 1/4 acre) and the use of a beautifully positioned swimming pool and Astro Turf tennis court set within 11 acres of shared grounds. The house is all on 1 level and has been lovingly finished using cotto tiled floors, waxed beams, traditional paint techniques and handmade furniture from Florence and Citta Di Castello. The 3 bedrooms have traditional cast iron beds, good quality mattresses and white linen. There are 2 bathrooms with showers, glass screens and heated towel rails. The living space has a stone fireplace and kitchen with dishwasher. There is also fast Wi-Fi broadband internet, a washing machine, flat screen satellite TV with Netflix, DVD/CD player and Bose bluetooth speaker. Outside: A pathway leads directly from the car parking area through the front garden to the house. All rooms are on the ground floor with no change in levels. Garden furniture, consisting of a white painted iron dining table with 6 chairs beneath the Pergola, 4 sun loungers and a Weber barbecue, is provided within the private, irrigated gardens stocked with olive and fruit trees (figs, plums, apricots and cherries), rosemary and lavender bushes. A private pathway leads towards the large, shared swimming pool which, together with the Astro Turf tennis court, have recently been completed. The grounds are tended and maintained by a Caretaker who is on hand for any assistance that may be required. At the heart of the Borgo lies the original villa and cobbled square. While children are welcome, please note that the swimming pool is not alarmed or fenced. Sorry but no pets are allowed. Perugia airport (Ryanair) approx 45 mins drive. Rome airports (BA, Ryanair, Alitalia, Easyjet etc) approx 2.25 hours drive. Ancona airport (Ryanair) approx 2.5 hours drive. Florence airport (BA) approx 2.25 hours drive. Both bathrooms have showers with glass screens, beautiful tiled floors and high quality chrome fittings. Wi-Fi Internet access throughout the villa. Large living area with cotto tiled floor comprises the kitchen, handmade dining table (six chairs), leather sofa, two stylish armchairs, coffee table, dresser and a striking stone fireplace. There is Wi-Fi Internet access, a flat screen Satellite TV with DVD/CD player and separate iPod docking station / speakers. Two sets of glazed, double wooden doors lead onto the rear garden with sweeping views. The kitchen area comprises an oven with hob, integral fridge, separate glass fronted wine/drinks fridge, washing machine, dishwasher, chrome toaster and kettle. Good quality white crockery and plenty of large wine glasses ! We had a wonderful time. The house is very comfortable and beautifully furnished and decorated. We also fell in love with the area, especially Todi which we thought was charming and unspoilt. We visited Assisi and Orvieto which were both fantastic. We had some great meals out and probably came home several pounds heavier! Many thanks for your kind words, we are delighted that you had a lovely holiday with your family. For a family of five with young children the property and facilities couldn't have been better. The house is beautifully arranged and the garden perfect for three kids to run around (and adults to lounge in). The pool was wonderful with extraordinary views. The tennis court was also great to use and the caretaker Kumar couldn't have been more helpful. If anything the pictures and description don't do justice to this wonderful property, which we'd have no hesitation in recommending. Many thanks indeed for your kind comments. We are delighted that you loved it as much as we do. All the best. We had a wonderful 10 days at the Villa relaxing and enjoying the local countryside. The house is tastefully decorated and worked for all 3 generations with a pool enjoyed by all, lovely gardens, and everything on just one floor so that my mother,with her crutches, could cope. It is pretty remote so a car is essential and there is no popping out for forgotten groceries. But as my husband marvelled "there are no man made noises". It was very peaceful and therefore hugely relaxing for a family all in need of a break. However, it was well located for trips to Todi, Orvieto, Assisi and other towns. The estate is extremely well supported by an on site care taker who met us , even though we were late and made sure that we were happy throughout our stay. The kitchen is well equipped so we tended to cook for ourselves in the evening to spare our driver as it was more fun to use local produce and also forage in the garden! But there are some excellent restaurants in the area within a !0 min drive. 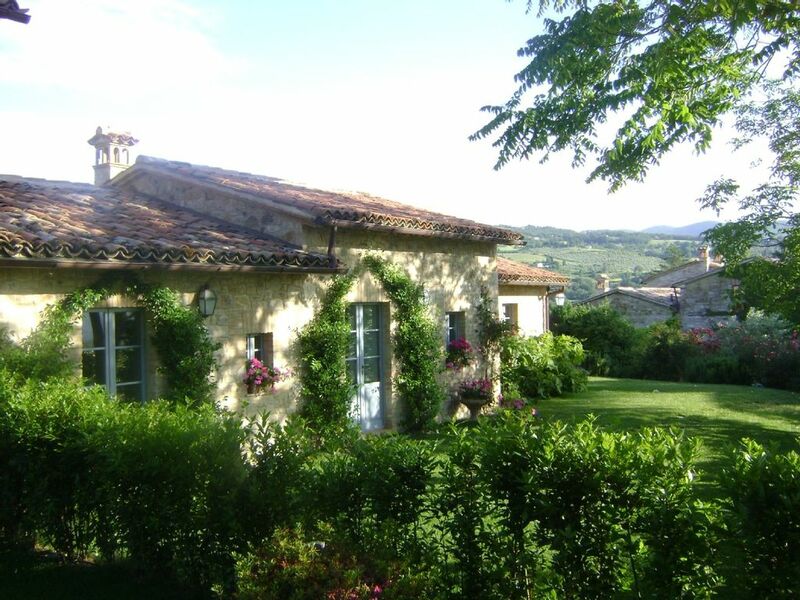 All in all a great place to stay for either a very relaxing quiet holiday or to use as a base to explore Umbria. Many thanks for your feedback, we are delighted you had a such a lovely holiday. We had an absolutely fabulous holiday at Borgo d'Asproli. We all fell in love with the cottage, the grounds and the surrounding countryside.The cottage and gardens were outstanding as was the the whole interior and equipment. We also liked the travel and area information that was available in the cottage and was very helpful. It is difficult to think of anything that needs improvement as it was furnished to a high standard. We found it a great centre and easily travelled up to Perugia in the north and south to Rome and Tivoli to the fountains at Villa Deste and all points in between. We have defenitely fallen in love with Umbria and the area around Todi in particular and could highly recommend it. All in all a wonderful holiday and a lovely experience! Thank you very much indeed for your review, we are delighted you had such a good holiday. We have just returned from Italy where we spent one week in Asproli. We went to Umbria looking to wind down and relax and spending some quality time with family and friends- the villa was the perfect escape. The house was totally set up to make you feel at home (books, dvds, tennis rackets, bbq..). As we love cooking and entertaining, the vegetable garden and grocery stores in Todi, made our meal preparations enjoyable and easy. A couple of things we would recommend: rent a car because everything is a short drive away, and for those who need to keep in contact with friends or business via internet, we found this very difficult to find. You can buy a chip (Vodafone in Perugia) and use it up in the hill, next to the church- great sunsets with great reception! We enjoyed visiting many of the small nearby towns, but specially Spello, which has a lively arts and food culture. For those interesting in scenic drives, at the top of the fernicular in Todi, you will find a map for the Circuiti del Paesaggio- with both driving and walking circuits. The villa is beautifully decorated and you instantly feel at home. Would definitely return for another holiday. My husband, 2 teenagers, 13 years and I stayed at Asproli in June this year. Everything about it was so perfect. The house is sp beautiful inside and out and is perfectly equipped for family holidays. Our kids are nearly 14 and I thought it might have been a little quiet for them, but not at all. In fact it proved impossible to drag them away from Asproli with the exception of just 2 days out. However we ate out in Todi every night and days just blended in to one idyllic blur! The area is magical and the little "estate" of houses is picture book pretty. Masses of roses, jasmine, lavender, fruit trees etc. all surrounded by gentle rolling hillside countryside and fabulous woods. We have been to many parts of France, Spain and Italy and this was the most beautiful area and property we have ever been to . I know it's such a cliche but the photos really do NOT do it justice. Todi is really gorgeous, much nicer and more real than places like San Giminiagno in Tuscany. Nice shops, great restaurants and little bars, coffee shops and gelateria that we really loved. we also went to Assissi which we also really enjoyed and would love to go back there. It is the first place that we have stayed that we ALL intend to return to. There was so much that we intended to do and just never got around to. The pool is fabulous and so too the savannah tennis court. Also the walking in the area is excellent, even in the heat! We saw hawks and buzzards, heard a cuckoo, saw every colour of butterfly, fabulous jewel coloured dragonflies that looked like they had flown off the set of Avatar and fireflies at night. Asproli just conspired everyday to hold onto us. If you are looking at this and wondering if you should book, then don't hesitate. The house is a 15 minute drive from Todi. It has been said that this majestic hill top, Umbrian walled town is one of the best places in the world to live (University of Kentucky research). The views are breathtaking and an extensive range of restaurants, shops, historical and cultural attractions are on hand. The Borgo is located just off the road to Orvieto and approx 1 hour from Assisi, two beautiful Umbrian towns which are well worth a visit. There are lots of places to visit and things to do within an easy drive, including vineyard tours & wine tasting, horse riding and cookery courses, and many great restaurants.